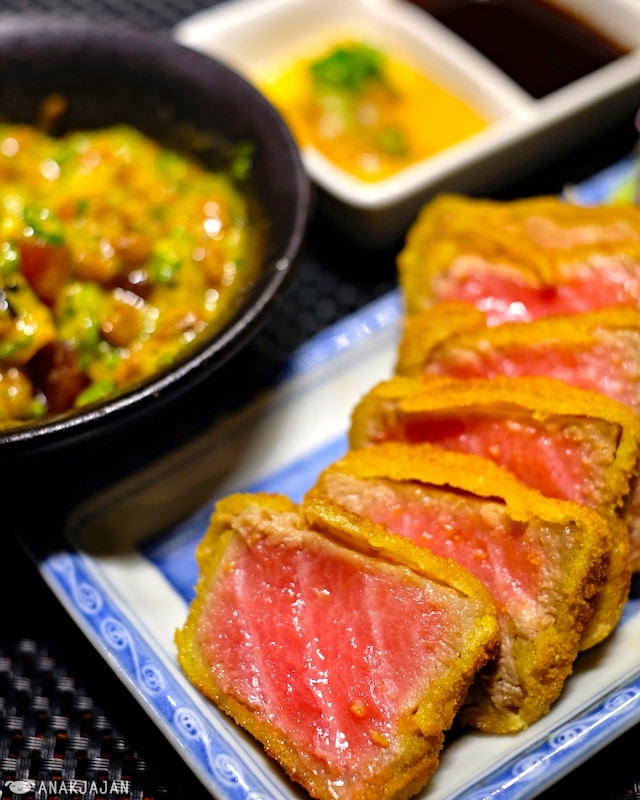 Tonkatsu … pork cutlet, is a Japanese dish which consists of a breaded, deep-fried pork cutlet. The two main types are fillet and loin. It is often served with shredded cabbage. 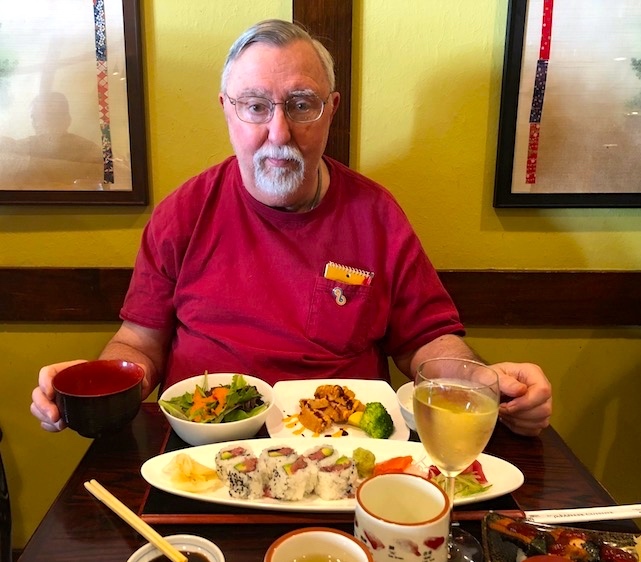 … The word tonkatsu is a combination of the Sino-Japanese word ton (豚) meaning “pig” and katsu (カツ), which is a shortened form of katsuretsu (カツレツ), the [borrowing] of the English word cutlet, which [in turn] derived from French côtelette, meaning “meat chop”. The trick, and it’s no mean trick, is to get it crispy on the outside and rare (to whatever degree of rareness you want) on the inside. At Kanpai the toro katsu comes with not only the brown sauce in #2 but also with a yellow sauce: Sriracha mayonnaise, Sriracha mayo for short. 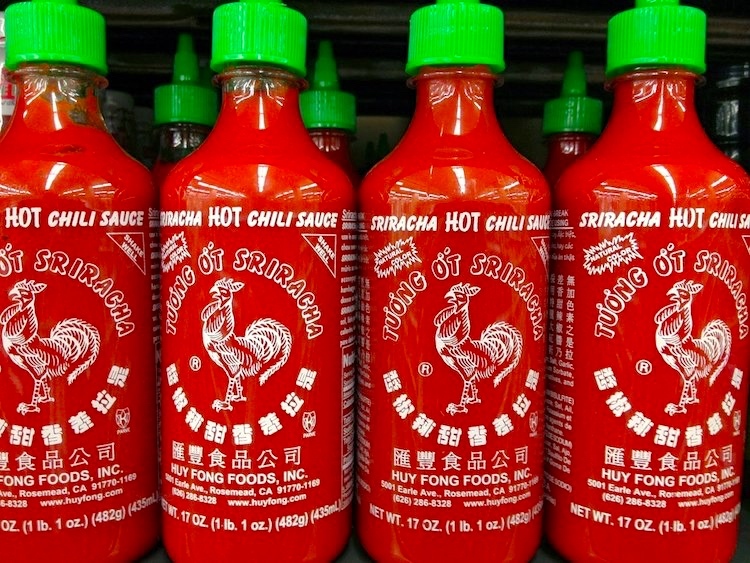 Sriracha is also eaten in soup, on eggs and burgers. Jams, lollipops, and cocktails have all been made using the sauce, and Sriracha-flavored potato chips have been marketed. That’s the sauce. Then to make the mayo from it. For Sriracha mayo, combine grated garlic, mayonnaise, Sriracha (or any other hot sauce), lemon juice, and salt. Ah, but what mayo? It’s not Japanese Sriracha mayo if you don’t use Japanese mayo. Yes, Japanese mayo is different from American mayo. American Mayo is usually made from a soy-based vegetable oil along with water, eggs, distilled vinegar, salt, and sugar. Some brands will add their own seasonings or even some lemon juice and dijon mustard but those are the primary ingredients. Japanese mayonnaise also uses soy-based vegetable oil and many of the same ingredients. They don’t add water however and Japanese mayo uses apple or rice vinegar rather than distilled vinegar. Japanese mayonnaise also uses egg yolks rather than whole eggs [so it’s yellow in color]. Using egg yolks and apple or rice vinegar and eliminating water gives Japanese mayonnaise a thicker texture than American mayonnaise and it is a rich and slightly sweet condiment. Some makers of Japanese mayonnaise also use monosodium glutamate which is a flavor enhancer that makes everything taste better. American mayonnaise is typically used on sandwiches or hamburgers, mixed in with a can of tuna fish, used to make chicken salad, and is also used as a base for a number of other sauces. 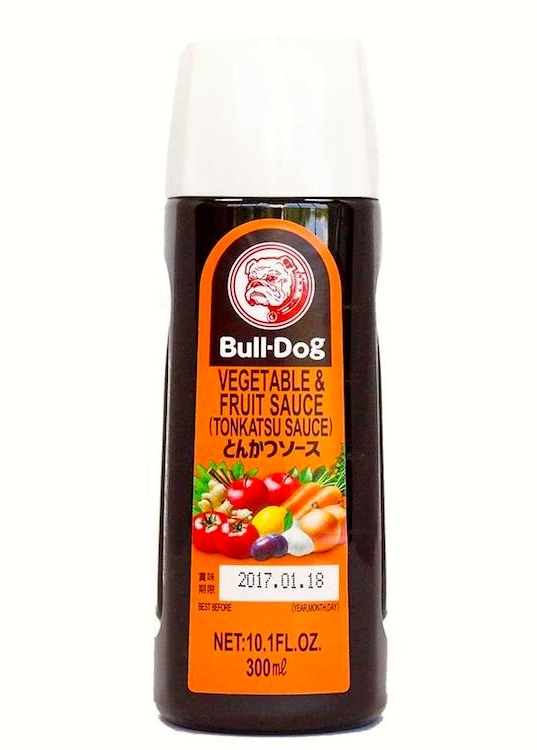 Japanese mayonnaise can be used in all of the same ways and it is commonly used to coat cooked vegetables and is often used as a side to a number of different Japanese dishes. 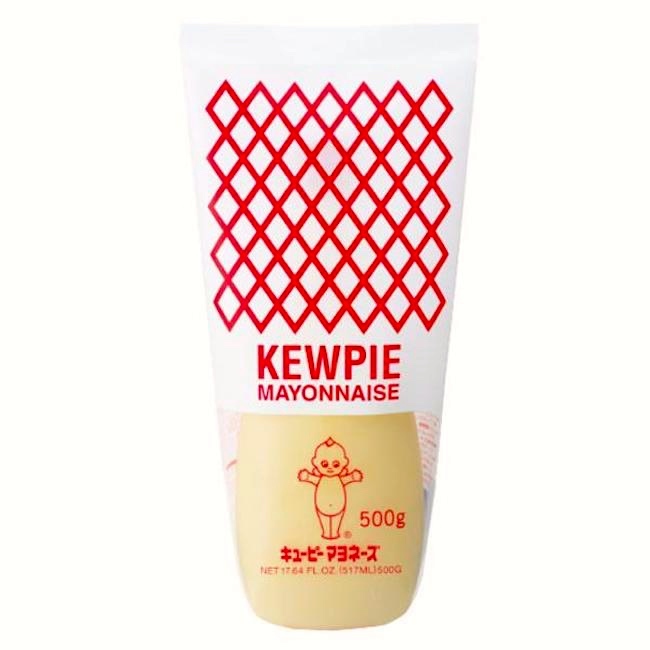 Japanese mayonnaise, pronounce in Japanese as Mayone-zu” or simply “mayo” (with a short “a” sound instead of the more familiar long “a”), is used in a number of other ways as well and some people think the Japanese might have an obsession with mayonnaise. In Japan you can find mayo flavored ice cream, mayonnaise flavored snacks and potato chips, it can be used as a spaghetti sauce and it can be used as a topping for toast, noodles, even pancakes. If you think it will taste good, you really can put it on just about anything. The Japanese fashion for mayo on almost everything seems to be relatively recent, having caught on in just the last 20 years or so. This entry was posted on September 12, 2018 at 10:20 am and is filed under Clipping, Holidays, Japanese, Language and food. You can follow any responses to this entry through the RSS 2.0 feed. You can leave a response, or trackback from your own site.